Final 4: Kansas, Villanova, Michigan, Loyola-Chicago Survive And Advance In Men's College Basketball : The Two-Way Villanova and Kansas, both top seeds, will face each other while No. 11 Loyola-Chicago will play No. 3 Michigan on Saturday in the semifinals in San Antonio, Texas. 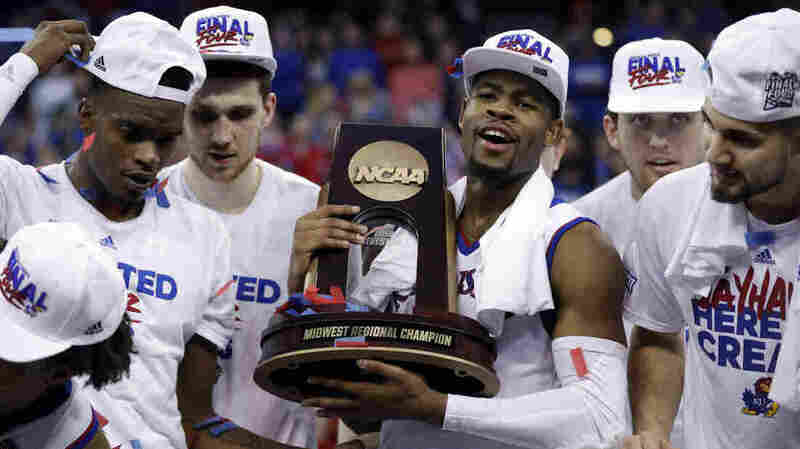 Kansas' Malik Newman holds the trophy after defeating Duke in a regional final game in the NCAA men's basketball tournament Sunday in Omaha, Neb. Kansas won 85-81 in overtime. After weeks of play, four teams are left standing: Villanova, Kansas, Michigan and Loyola-Chicago. The Villanova Wildcats and Kansas Jayhawks aren't really a surprise — they were both top seeds heading into the tournament. They will play each other on Saturday in San Antonio, Texas, and then only one top seeded team will remain. The other semifinal game features No. 3 Michigan Wolverines and No. 11 Loyola-Chicago Ramblers. The Ramblers may have a bit of an edge. After all, they have Sister Jean Delores Schmidt. If you've seen any of their games on TV, the 98-year-old nun is hard to miss. Sister Jean serves as the chaplain of the basketball team and apparently is a mighty good luck charm and a marketer's dream. ESPN reports that Loyola-Chicago officials have asked Sister Jean for permission to license her name and image as demand from licensees came in to the school's athletic department. "We weren't going to do anything until she gave her blessing," said Tom Sorboro, a senior associate athletic director at the school. "She didn't ask for anything for herself," including compensation, Sorboro said. "So far, Loyola has approved more than 25 Sister Jean T-shirts from a variety of companies including Fanatics, which made a Final Four shirt with her phrase, "Worship. Work And Win." The school also promises more Sister Jean bobbleheads in June — supplies have been depleted for now. Loyola-Chicago got to the Final Four by defeating Kansas State over the weekend — becoming only the fourth No. 11 seed to reach the Final Four. "Loyola-Chicago faces a Michigan team whose big men Moe Wagner and Duncan Robinson helped the Wolverines squeeze past Florida State. It took overtime and a career game from Malik Newman for Kansas to get past Duke to reach the semifinals — they came just short of the past two years. They meet Villanova, a team of prolific scorers that relied on defense to out-muscle Texas Tech." Villanova won the national title two years ago. Juniors Jalen Brunson and Mikal Bridges were on that championship team. They are now the Wildcats leading scorers. In 2008, Kansas won the championship. Since then, they have been seeded No. 1 five times but failed to make the Final Four any of those times. Michigan has won one national championship and been to eight Final Fours. They had a 13-game winning streak this season, which is only second to Loyola-Chicago, which won 14 straight. The last time Loyola-Chicago won the championship was in 1963. An earlier version of this story referred to Michigan State, which won the championship in 1989. An earlier version of this story, and correction, also incorrectly noted that Michigan has won 14 championships. It has won 14 Big Ten conference championships, but only one national championship.